Maplebrook Farm cheeses are made daily by skilled old-world cheese artisans. We make our own curd from the milk of cows that are rBGH free and that graze in the green mountains of Vermont. 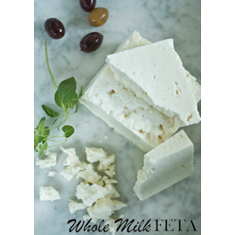 Our cheeses are made in small batches using all natural ingredients with no preservatives. Our cheese is a 100% Vermont product. When you buy this product, you are directly helping to support small dairy farms of Vermont. All our cheese is made from whole milk that has been pasteurized. A gluten free product and there is no corn in the vegetable rennet we use. In 2003, while visiting Manchester, Vermont, Johann Englert had a flash-back to her college years. A cluster of fresh mozzarella balls sitting on the counter of Al Ducci’s Groceria reminded her of a groceria she and her mother had visited while traveling in Italy. 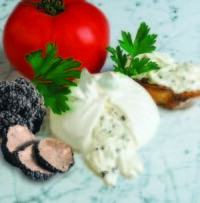 The cheese artisans at Al Ducci’s produced genuine, Old World mozzarella. Johann could not find that level of quality in Boston and bought 20 balls of mozzarella on the spot. She asked Mike Scheps, the owner’s son and third generation cheesemaker, if he would be able to supply her with small quantities. Little did they know, a business was born. After sampling those 20 balls, 5 out of 6 gourmet shops in Boston wanted more of this genuine mozzarella. Johann and Mike were onto something. Business boomed as the operation moved from a kitchen to a small store to the purchase of a building. They developed an apprenticeship program to teach new employees the art of making perfect mozzarella. The program started with 3 local Vermonters and has grown to include 20 employees who are making small batches of cheese and wrapping them by hand every day of the week. From those first 20 mozzarella balls to the current 20,000 produced weekly, Maplebrook Farm has established itself as a premier artisan cheese producer distributing products up and down the East Coast.